Numero Uno foodwise on our NOLA trip was Cochon, which I told you about, but that is certainly not where the tasty food ended! Names one of the "Top 10 Best New Chefs in America" by Food & Wine, if anyone knows food, it's John Besh, so I couldn't pass up the opportunity to visit one of his restaurants when I was in NOLA. He and Brian Landry share their love for Louisiana seafood, which is perfectly clear when you dine at Borgne. I know this sounds silly, and maybe it is because we were just starved, but this was the best bread and butter we ever ate! Smooooooth sweet butter with a nice warm loaf. Yes. Please. These croquettas really blew our mind. Served with chipotle remoulade, we were fighting over the last one (#fatgirlproblems) and dipping some of that fantastic bread in the extra sauce. The star of the show at Borgne BY FAR for me was the grilled octopus. Served over berber hummus and topped with a garlic caper confit, my taste buds were totally having a party, I had never had such large, plump, juicy pieces of octopus in my life. Nicole (one of my travel pals) and I were dreaming about this app all week... I would have been happy to have a larger portion of this as my entree. A#1FAVE. Although the octo was perfection, this shrimp casserole was pretty bomb too. Served hot in a cast-iron skillet, this baby was fresh as can be, with a mix of red peppers, cherry tomatoes and mirliton, the textures going on here were incredible. Nicole has the crawfish cavateli, which was creamy and wonderful (I mean, there was freakin' marscarpone cream in it!) and Amy had the Crispy Pork Shank, which she was head over heels for. No meal on vacation is complete without dessert. We went with the strawberry fried pies, and were not disappointed. 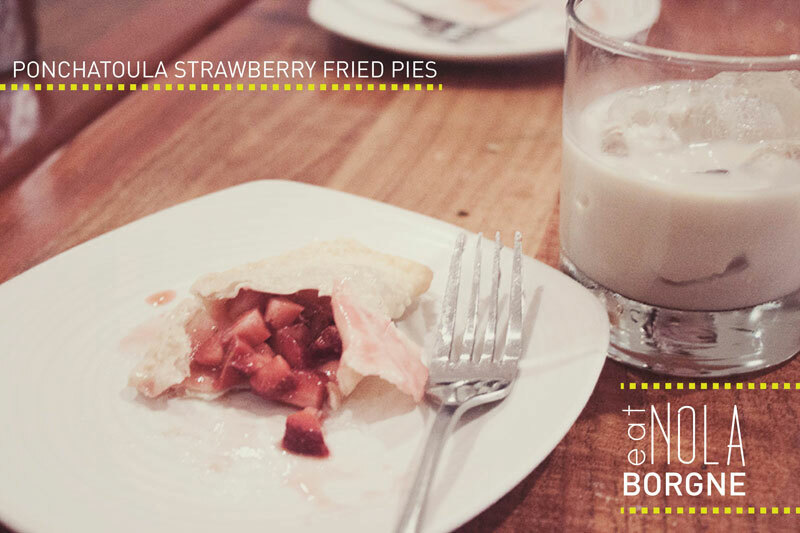 Filled with fresh strawberry and lightly fried, I paired it with a Bailey's on the rocks (yummmmo), this was a perfect end to this meal. From beginning to end, the ingredients were fresh and the art John and Brian came though in every bite. I am so excited that we got to dine here, and I recommend you do too. I def. hope to try another one of John Besh's restaurants when I can! I'm feeeeeeeelin' inspired again. Come back on Friday to see what I cook up (see what I did there? ).